I decided to get real hands on with this project. My key chain needed something other than, well, keys. Enter the DIY side of my brain. 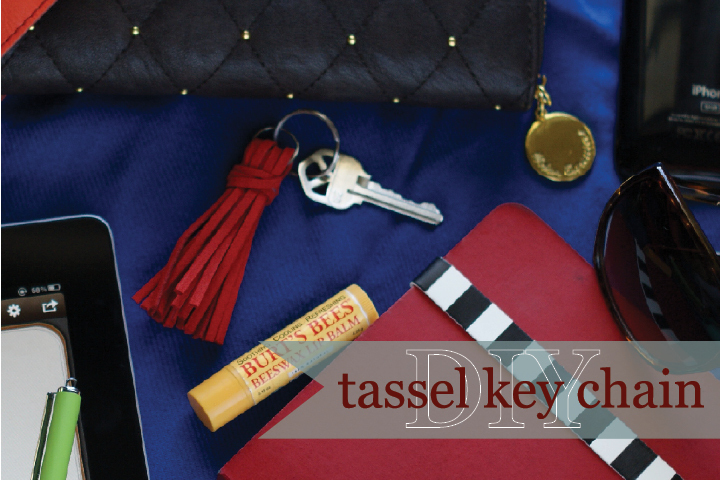 I like tassels – they are simple and classic and way easy to make. 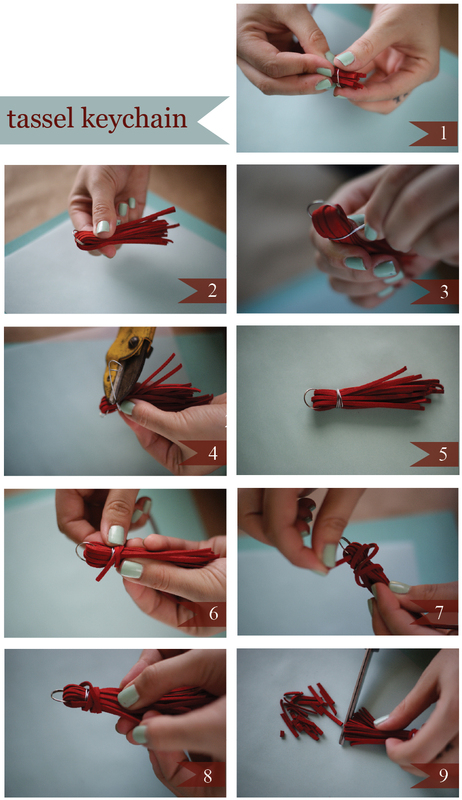 Step one: feed the leather strips (about 6 inches long) through the smaller key chain – leave one out for step 6. Step two: fold the strips over the key chain. Step three: twist the wire about half an inch below the fold to secure the strips. Step four: cut the wire. 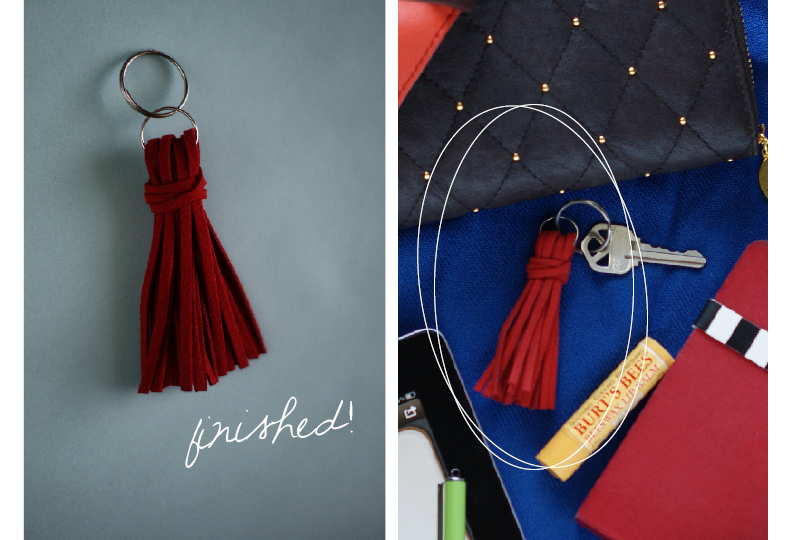 Step five: not really a step…just what the tassel should currently look like. Step six: take the extra leather strip and tuck into the wire. Wrap around the tassel to cover the wire. Step seven: feed the end of the strip through the hole above the wire wrap under the fold. Step eight: feed the end of the strip through the wrapped leather. Pull tight to secure it. Step nine: cut the ends to make all strips even. Attach to the bigger key chain. Viola! Awesome use of a tassel! i’m such an earthy color person, i went with the red. but you’re right – neon would be great! 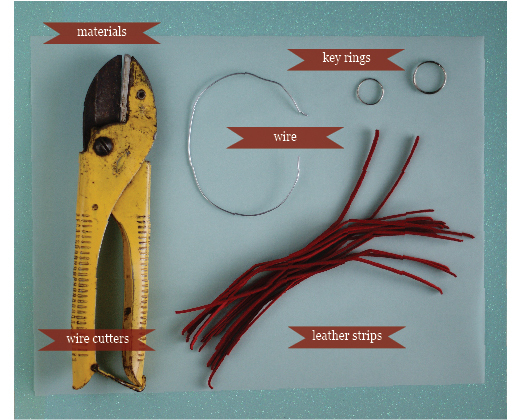 I just discovered your blog and am loving your simple but brilliant DIY ideas. So fun! I love the idea!!! So cute!!! Great idea, and just what I need! SUCH a cute idea! I’m inspired to get crafty now… thanks!